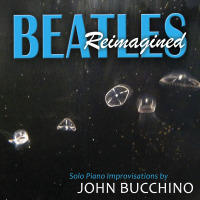 BEATLES REIMAGINED features John's solo piano improvisations on Beatles classics. I remember sitting glued to the TV at my grandmother’s house in South Philadelphia, watching The Beatles’ first appearance on the Ed Sullivan show. I had already been playing piano for 10 years at that point (I was 11) and these new sounds made my fingers itch. When Sergeant Pepper’s Lonely Hearts Club Band came out, it exponentially expanded my concept of what was musically possible, and I stretched to funnel it all down into one piano. I tried to capture Paul’s bouncy melodic bass lines in my left hand as well as a sense of Ringo’s tom fills. And my right hand reached for the melody, John’s rhythm guitar pulse and George’s solos. I’ve played Beatle songs most of my life. They’re a part of me. So I decided to sit down and improvise them in whatever arrangements popped into my mind in the moment, and then share the takes I liked best. That’s how this CD came about. None of these versions was premeditated. Each happened in this particular way once and only once. Each intro, tempo, style and solo manifested at the instant when fingers hit keys. Eleven of the fifteen are unedited. The other four are a merging of two spontaneous takes. No overdubs, two hands, (except for “Ob-La-Di, Ob-La-Da,” which was played with right hand only, goofing around when I thought the recorder was off.) I’m sure I can play these songs “better,” cleaner, more dramatically, but this is what happened in these particular snapshots at these particular sessions. I hope you enjoy!